Saturday. 18th February , 2012. My first date with her. At one of the historic monuments of Hyderabad – Golconda Fort, a fort built in 1600s, famous for its magical acoustic system. An unusual choice, probably, for a date? But that’s how it was. She arrived there like the leisurely breeze – simplicity and innocence draped in ‘white and blue’. She taught me how to handle a SLR camera. It was the first time i was shooting with a digital SLR camera. She had given colors to my imagination. I clicked a lot that day – shot the beautiful and grand fort, its minarets, courtyards and walls, flowers in the lawn, and most importantly, captured her in my eyes. Since that day, i never let my eyes lose sight of her. And the reward? Not this photo here, though it’s a memorable one, for being one of my first shots with a digital SLR camera. But that day I received a special reward – reward for the rest of my life. Her. My wife. We married and and now we shoot together as a team. This post was part of the weekly challenge Reward. More photos of monuments here. 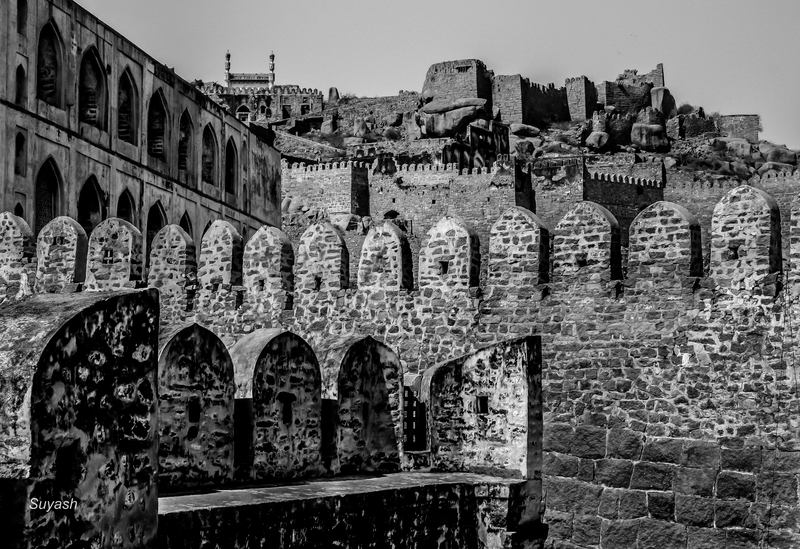 This entry was posted in India, Life, Photography, Travel and tagged Architecture, Date, Golconda Fort Hyderabad, Hyderabad, India, Life, love, Monument, Photography, Travel. Bookmark the permalink. Wow! That’s some terrific B&W image. The fort has come up so well in mono. You are lucky guy! A wonderful reward indeed! Yes, its a lifetime reward and I considered myself so fortunate to have her in my life.